It’s owned and operated by a guy that boxed against Joe Lewis. It was featured in State of Grace with Gary Oldman and Ed Harris. 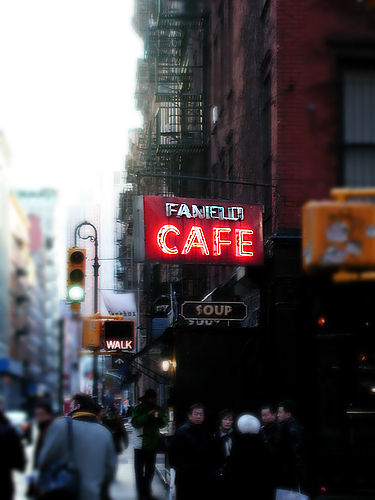 But for some reason, many New Yorker’s don’t know about Fanelli’s, even though it’s on the corner of Prince and Mercer in the middle of Soho, and it’s always full. There’s a tiny little neon sign over the place. Inside, there are small tables with traditional red-checked clothes crowded into a long, narrow space. Black and white photos of boxing matches cover the wall. Across from the tables is a long bar, with stools filled with old timers, who might be Teamsters, or Mafia, polished, young executives, a few hipsters and the odd foreigner. Smoke floats to the ceiling. This is home to the best Bloody Mary in New York—not too spicy but it has a bite. Not too strong, but enough to relax you. The burgers rival any burger in the city and are cooked at medium rare—whether you like it or not. Their best food is a dieter’s nightmare—chicken wings and cheese sticks—and the drinks flow even more heavily. If you’re looking for something immaculate and minimalist, this ain’t it. It’s a place that you go to because it’s easy to get to. It’s got that sense of time when cabbies in NY knew the city like the back of their hand. This is one of the places they’d tell you to go eat. It’s charming. It’s not trendy, but it sure is hip.